The upcoming issue of Mojo Magazine in the UK features a cover mounted CD of “Desert Songs,” the CD has artwork that brings to mind The Joshua Tree and ties into the cover story about the new tour. There is however no music featuring U2 on the CD. This time around we are going to look back into history a few other items featuring or tied to U2 over the years. And we’ll return for a closer look at that Mojo compiled CD at the end, including the full track listing of the CD. The second release that featured U2 as a band, outside of the albums and singles, was a free promotional cassette given away with NME magazine. The year was 1981, and NME was releasing cassettes through the magazine. 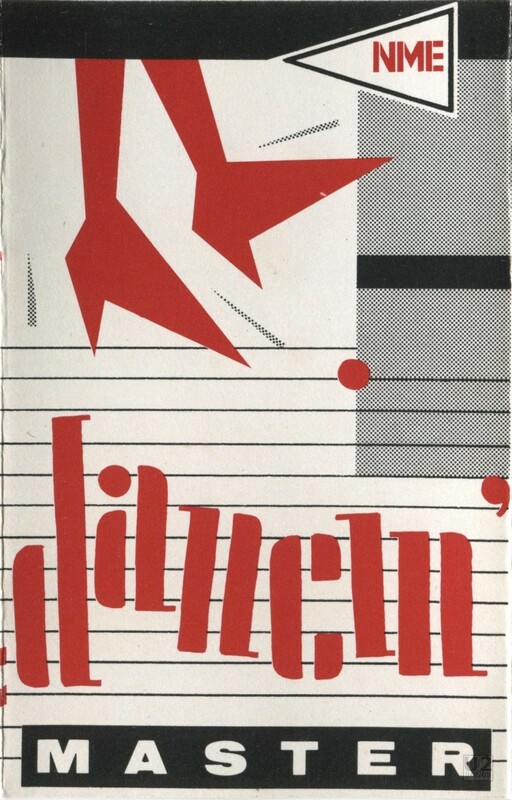 This first cassette, “Dancin’ Master“ featured the catalog number NME 001. This wasn’t a true cover mounted item, as it was available by voucher. You had to cut out the voucher and send it into the magazine in order to get the cassette. The cassette featured U2’s performances of “An Cat Dubh” and “Into the Heart” from a March 6, 1981 concert in Boston MA. From the magazine that carried the voucher for the cassette the magazine described the track as “Bono Vox’s Celtic Crusaders bedazzle Bean Town USA. In other words, U2 live in Boston.” The magazine also featured a booklet of information about the tracks which you could cut out and assemble a little cassette sized booklet to go with the cassette. This time the release was vinyl, and it actually was attached to the front of the NME magazine. The May 25, 1984 issue of the magazine included a Readers Poll winners list. And the cover mounted 7-inch vinyl contained tracks from four of the winners. In U2’s case, it is a unique remix of “Wire” titled the “Dub Mix” on the vinyl itself and the “Celtic Dub Mix” on the cover of the magazine. 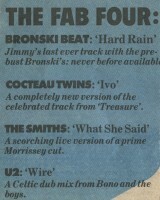 The vinyl also featured tracks from The Smiths (“Best Group”), Bronski Beat (“Best New Act”) and The Cocteau Twins (“Best Album”). U2 themselves had not won, but Bono had been voted as “Best Male Singer”. 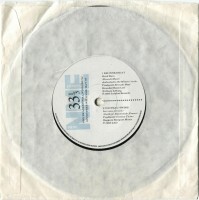 The single itself was released in a plain white sleeve which was taped to the magazine. Once you removed the single there was a large area that said “Ripped Off” so people would know they had not gotten the single. This remix of “Wire” would be included on the 2009 remaster of “The Unforgettable Fire”. Select Magazine also featured some cover mounted compilations over the years and a number of times U2 would appear. The first appearance was in 1993 on the cassette called “Island Select“ where U2 would contribute “Salome (Zooromancer Remix Edit)”. The cover of the magazine promoted “Free Tape! Rare and Unreleased tunes by U2” and also provided a £6.00 discount for any of the artists at HMV. This particular mix of Salome is 06:50 in length making it shorter than the versions found on the U2 single, but longer than the version used on The Best of 1990 – 2000 and remains unique to this cassette. In 1995 U2 would pop up on another release from Select Magazine, this one titled “Select Presents Exclusives“. This time the song was “Stay (Underdog Mix)” and at the time of release it was the only place you could find that track outside of the fanclub album Melon released at the same time. 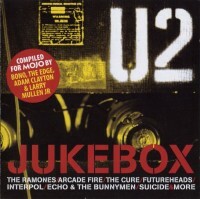 U2 has appeared on a number of these cover mounted compilations over the years. A Danish magazine titled Zoo Magazine featured a remix of Discotheque by David Holmes, and in 1997 it was the only place to get a digital version of that mix. A flexible 7-inch single was released on Buzz magazine in South America featuring “I Still Haven’t Found What I’m Looking For”. Wild Magazine from Denmark once featured the Passengers track “Elvis Ate America”. They’ve also appeared on a number of CDs released by Q Magazine over the years. Below are the discography links for some of these items. In many of the above examples it does appear to be just a random compilation that includes U2. Perhaps some thought was given to the releases where an exclusive track was made available, but in most cases there would have been very little direct input from U2 in any of these compilations. But my favorite two cover mounted releases both featured direct input from the band. In 2005 Mojo Magazine featured a cover story on the band during their worldwide Vertigo tour. As part of the article, the magazine asked the band to curate a CD for them. The band agreed and Mojo released the “U2 Jukebox” with that issue. 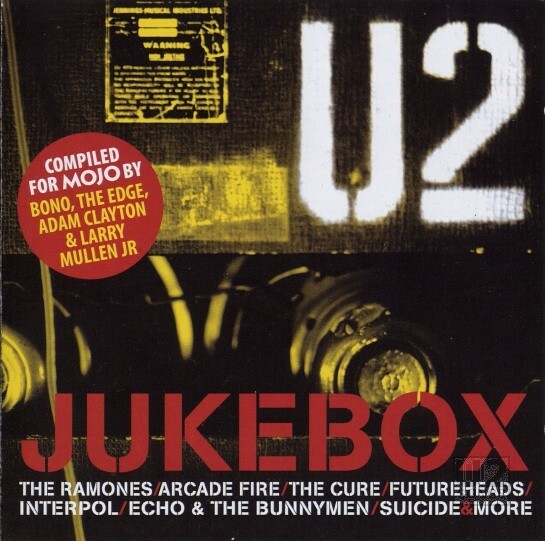 The cover promoted “compiled for Mojo by Bono, The Edge, Adam Clayton & Larry Mullen Jr”. The artwork used for the CD was provided by photographer Kevin Westenberg who photographed some of U2’s stage set up for the tour. The band apparently chose 30 songs for the collection as the tour was starting in April 2005, reflecting their current and past favorites. The folks at Mojo then worked on getting clearance and mixing the CD. In the end the CD featured 15 tracks, opening with “Wake Up” by Arcade Fire as the opening song, the same song U2 was chosing to take the stage to each night during the tour. 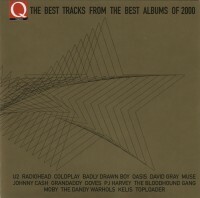 The full track listing included Arcade Fire “Wake Up,” Modest Mouse “Float On,” Charlotte Hatherly “Grey Will Fade,” Interpol “Obstacle 1,” Virgin Prunes “Pagan Lovesong,” Suicide “Dream Baby Dream,” Pere Ubu “30 Seconds Over Tokyo,” The Futureheads “Hounds of Love,” The Go-Betweens “Cattle and Cane,” The Cure “A Forest,” Echo and the Bunnymen “The Cutter,” Siouxsie and the Banshees “Christine,” and The Ramones “Glad to See You Go.” There is no track with U2 on this CD but it’s the closest thing we have ever gotten to U2 making a mix tape for us, and its still one of my favorite mixes. “Zoo Station” by Nine Inch Nails, “So Cruel” by Depeche Mode, “Love is Blindness” by Jack White. This CD featured some amazing artists covering U2’s music. The CD also featured “One” by Damien Rice, “Until the End of the World” by Patti Smith, “Who’s Gonna Ride Your Wild Horses” by Garbage, “The Fly” by Gavin Friday, “Mysterious Ways” by Snow Patrol, “Tryin’ To Throw Your Arms Around the World” by The Fray, “Ultra Violet (Light My Way)” by the Killers, and “Acrobat” by Glasvegas. And this CD for Mojo? This upcoming “Desert Songs” CD for Mojo doesn’t feature any input from U2 that we can tell. It is a collection of desert songs. The CD itself uses black and gold images similar to U2’s “The Joshua Tree” and does include a silhouette of a Joshua Tree on the back cover, but not the one we know best. None of these songs have any U2 participation. Nor is there any indication of U2 having been involved in the choosing of the songs. In 2003 Uncut Magazine did a CD of songs called “The Music that Inspired The Joshua Tree: In Gods Country” and that too was put together with no input from the band, although it did use images from the desert. That particular CD had featured tracks from artists such as Hank Williams, Elvis Presley, Patsy Cline and Woody Guthrie. Reference for the song originally came from studio playbacks of Suicide records (not least, Cheree from the New York electronic duo’s eponymous 1977 debut) and the arrival of Lanois’ friend Michael Brook’s Infinite Guitar – a prototype instrument promising ultimate sustain that, if assembled wrongly, would give its player electric shocks. In the Edge’s hands it produced the song’s atmospheric, humming heart. That piece of the article has me longing for another U2 curated CD. One of influences that the band were listening to as they developed “The Joshua Tree”. In other parts of the article Nick Cave & The Bad Seeds’ 1985 album “The Firstborn Is Dead” is mentioned for its sonic inspiration and Bono mentions being able to hear Echo & The Bunnymen in his vocals in a later part of the article. It would have been nice to have a collection of those influences, curated by U2 themselves. Here’s that track from Suicide for those who are interested. The new cover mount CD comes with issue 281 of Mojo Magazine, and will be released in the UK on Tuesday February 21 to newsstands. The magazine carries a cover date of April 2017 and features U2 on the cover. Mojo has printed a preview of the article. The issue can also be ordered online direct from Mojo.